The process of degradation of the elastin-rich extracellular matrix produces elastin-derived peptides (EDPs). Different types of EDPs are detectable in the cerebrospinal fluid in healthy individuals and in patients after ischemic stroke. To date, it has been demonstrated that EDPs can regulate the development of insulin resistance in mice in a peroxisome proliferator-activated receptor gamma (Pparγ)-dependent manner. Therefore, the aim of this study was to investigate the impact of the elastin-derived valine-glycine-valine-alanine-proline-glycine (VGVAPG) peptide on Pparγ and beta-galactosidase (β-Gal) expression in mouse cortical astrocytes in vitro. Primary astrocytes were maintained in DMEM/F12 without phenol red supplemented with 10% fetal bovine serum. The cells were exposed to 50 nM, 1 and 50 μM of the VGVAPG peptide. After 3 and 6 h (for mRNA) and 24 and 48 h (for the protein) of exposition to the peptide, the expression of Pparγ and β-Gal was measured. Moreover, the siRNA gene knockdown method was applied. Our study showed, for the first time, that the VGVAPG peptide affected β-Gal and Pparγ mRNA and protein expression in mouse astrocytes in vitro. Furthermore, we suggested a bidirectional interaction between Pparγ and β-Gal. Both pioglitazone and rosiglitazone increased β-Gal and Pparγ protein expression in mouse astrocytes in vitro, and this effect was reduced by the VGVAPG peptide. However, due to the lack of sufficient data explaining the molecular mechanism of action of the VGVAPG peptide in the nervous system, more studies are necessary in this field. Elastin is the main component of the extracellular matrix in mammalian organisms. Degradation of the elastin-rich extracellular matrix by numerous proteinases leaking from the serum and secreted from the infiltrating platelets, leukocytes, activated vascular cells or the ageing process produce elastin-derived peptides (EDPs) (Mochizuki et al. 2002). The abovementioned cells are involved in the pathogenesis of atherosclerosis (Falk 2006). EDPs also induce an autoimmune reaction that participates in the development of this disease (Matsuura et al. 2014). Ischemic stroke is an important clinical complication of atherosclerosis that concerns the cerebrovascular system (Zhou et al. 2014). Different types of EDPs are detectable in the cerebrospinal fluid (CSF) in groups of healthy individuals and in patients after ischemic stroke (Nicoloff et al. 2008; Tzvetanov et al. 2008). Moreover, the concentration of EDPs increases in the human brain along with the age of the individual. Specific repeating sequences can be found in elastin and in EDPs; one of these sequences is the valine-glycine-valine-alanine-proline-glycine (VGVAPG) hexapeptide. The VGVAPG sequence is repeated many times in human, bovine and porcine elastin molecules, but it is not present in the chicken elastin molecule (Bressan et al. 1987; Tajima et al. 1997). VGVAPG is liberated from elastin EDP in various physiological and pathological conditions (Gmiński et al. 1992; Gminski et al. 1993). The VGVAPG peptide binds with high affinity to the 67-kDa elastin-binding protein (EBP) (Senior et al. 1984; Blood et al. 1988). EBP is an enzymatically inactive spliced variant of beta-galactosidase (S-Gal) produced by alternative splicing of the Glb1 gene (Hinek et al. 1993; Skeie et al. 2012). It has been demonstrated that VGVAPG induces diverse biological effects such as cell proliferation, migration and differentiation through activation of EBP (Senior et al. 1984; Blood et al. 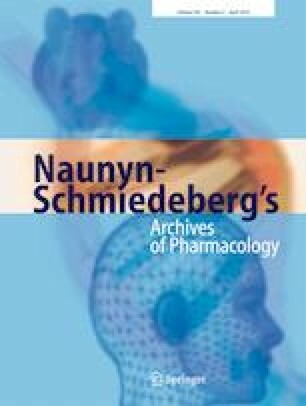 1988; Jung et al. 1998; Pocza et al. 2008). Moreover, activation of this receptor results in progression of the atherosclerotic process (Maurice et al. 2013). However, to date, only one paper investigated the role of the VGVAPG peptide and activation of EBP in normal astrocytes (Szychowski et al. 2018). Peroxisome proliferator-activated receptor gamma (PPARγ) is a member of the nuclear receptor superfamily and regulates the cell metabolism of carbohydrates, lipid metabolism as well as cell differentiation, proliferation, apoptosis and the inflammation process (Chawla et al. 2001; Chou et al. 2007; Szychowski et al. 2017). It has been shown that this receptor is also important in astrocyte metabolism, astrocyte-mediated inflammation associated with degenerative pathologies such as Alzheimer’s and Parkinson’s diseases, multiple sclerosis and in type 2 diabetic mellitus (T2DM) (Iglesias et al. 2017). Moreover, PPARγ plays an important role in seizure modulation (Lucchi et al. 2017). To date, the thiazolidinediones (TZDs) such as rosiglitazone or pioglitazone are well-known agonists of PPARγ. TZDs, by activation of PPARγ, reduce insulin resistance by increasing the peripheral uptake of glucose. However, the complete mechanism by which the activated PPARγ is involved in reducing insulin resistance is not yet known. To date, insulin resistance has been linked to the expression of neutrophil elastase, a key enzyme that causes elastin fragmentation (Talukdar et al. 2012). Furthermore, it has been demonstrated that EDPs can regulate the development of insulin resistance in mice via a PPARγ-dependent pathway (Blaise et al. 2013). Therefore, the aim of this study was to investigate the impact of the elastin-derived VGVAPG peptide on peroxisome proliferator-activated receptor gamma (Pparγ) and beta-galactosidase (β-Gal) expression in mouse cortical astrocytes in vitro. DMEM/F12 without phenol red along with trypsin, rosiglitazone, pioglitazone, penicillin, streptomycin and dimethyl sulfoxide (DMSO) were purchased from Sigma-Aldrich (St. Louis, MO, USA). Glb1 gene siRNA (sc-61342) was purchased from Santa Cruz Biotechnology (Santa Cruz, CA, USA). INTERFERin® siRNA transfection reagent was purchased from Polyplus-transfection (Illkirch, France). The VGVAPG peptide was synthesised by LipoPharm.pl (Gdańsk, Poland). Charcoal/dextran-treated fetal bovine serum (FBS) was purchased from EURx (Gdańsk, Poland). The High Capacity cDNA – Reverse Transcription Kit and the TaqMan® probes corresponding to specific genes encoding Actb (Mm00607939_s1), Pparγ (Mm00440945_m1) and Glb1 (Mm00515342_m1) were obtained from Life Technologies Applied Biosystems (Foster City, CA, USA). ELISA kits for Pparγ (E-EL-M0893) and β-Gal (E-EL-M0525) were purchased from Elabscience Biotechnology (Wuhan, China). The experiments were performed on mouse astrocyte cell cultures. The cell cultures were prepared from the foetuses of pregnant female Swiss mice on day 17/18 of gestation. All procedures were performed in accordance with the National Institutes of Health Guidelines for the Care and Use of Laboratory Animals and were approved by a Bioethics Commission (No. 46/2014) as compliant with Polish law. The cells were seeded at a density of 20 × 106 cells/75 cm2 in culture flasks in DMEM/F12 without phenol red supplemented with 10% fetal bovine serum (FBS), 100 U/mL penicillin, 0.10 mg/mL streptomycin and 250 ng/mL amphotericin B according to a previously described method (Szychowski et al. 2018). Our isolation and culture method of cortical glial cells, which resulted in an astrocyte purity of greater than 98%, was revealed using the antibody against the glial fibrillary acidic protein (GFAP) immunofluorescent staining (Szychowski et al. 2018). The cultures of glial cells were maintained at 37 °C in a humidified atmosphere containing 5% CO2. In the logarithmic phase, after reaching 90% confluence, the cells were trypsinised with 0.25% trypsin/0.05% EDTA and passaged onto an experimental plate. The astrocytes were seeded at a density of 60 × 105 per well in a 12-well plate and 150 × 105 per well in a 6-well plate. The culture medium was changed prior to the experiment with the VGVAPG peptide and tool compound selected for this study. In the first stage of our study, we determined the mRNA and protein expression of β-Gal and Pparγ in astrocytes. Cell cultures were exposed to VGVAPG peptide (50 nM, 1 and 50 μM) for 3 and 6 h (for mRNA) or 24 and 48 h (for protein) then β-Gal and Pparγ expression have been measured. The chosen concentrations of VGVAPG peptides cover EDPs level detected in human brain under normal and pathological conditions. This was also previously described in literature (Nicoloff et al. 2008; Tzvetanov et al. 2008; Szychowski et al. 2018). In the second stage of our study, we used the siRNA gene silencing procedure to clarify the roles of β-Gal and Pparγ in the VGVAPG peptide mechanism of action. The silencing procedure is described in the “siRNA gene silencing procedure” section. After this procedure, β-Gal and Pparγ mRNA and protein expression have been measured after 6 (for mRNA), 24 and 48 h (for protein). The last stage of our research was to determine the role of PPARγ receptor agonists (rosiglitazone and pioglitazone) in the VGVAPG peptide mechanism of action. Similar as in the silencing procedure, β-Gal and Pparγ protein expression have been measured after 24 and 48 h. Concentrations of rosiglitazone and pioglitazone (10 μM) were chosen based on literature data and preliminary experiments (data not shown) (Pérez-Ortiz et al. 2007; Gurley et al. 2008; Tencer et al. 2008). Rosiglitazone and pioglitazone had been added to the culture media 45–60 min before the VGVAPG peptide was added. To avoid non-specific effects of tool compounds, effects of rosiglitazone, pioglitazone, siRNA and transfection reagents were used at concentrations that did not affect the control levels of lactate dehydrogenase (LDH release) and resazurine reduction assays (data not shown). Moreover, in optimization experiments, the VVGPGA peptide (random sequence) was used (data not shown). Stock solutions of the VGVAPG peptide were prepared in DMSO and were added to the DMEM/F12 medium. The final concentration of DMSO in the culture medium was always 0.1%. Glb1 siRNA or Pparγ siRNA was used to inhibit Glb1 or Pparγ gene expression in mouse primary astrocytes. The experiment was performed in accordance with a previously described procedure (Szychowski et al. 2018). Briefly, Glb1 siRNA or Pparγ siRNA was applied for 7 h at a final concentration of 50 nM in serum and antibiotic-free medium containing the siRNA transfection reagent INTERFERin. For the experiments, the cells were plated on 6 (for protein expression)- or 12 (for mRNA expression)-well plates. After transfection, the culture medium was changed onto a normal culture medium (without antibiotic) and the astrocytes were cultured for 12 h prior to starting the experiment. Vehicle controls included positive siRNA and scramble siRNA containing a scrambled sequence that did not lead to specific degradation of any known cellular mRNA. The effectiveness of Glb1 mRNA or Pparγ mRNA silencing with the use of 50 nM specific siRNA was verified by measurements of mRNA and protein levels. After the gene silencing procedure, astrocytes were exposed to a 1-μM VGVAPG peptide for 6 (for mRNA expression), 24 and 48 h (for protein expression). The experiment was performed in accordance with a previously described procedure (Szychowski et al. 2017). For the real-time PCR assay, astrocytes were seeded onto 12-well plates and initially cultured for 24 h. After 3 and 6 h of exposure to 50 nM, 1 and 50 μM of the VGVAPG peptide, the samples were collected and total RNA was extracted from the astrocytes using a Qiagen RNeasy Mini Kit according to the manufacturer’s protocol based on a previously described method. After siRNA transfection, the procedure was performed after 3 and 6 h of exposure only for a concentration of 1 μM of VGVAPG. Both the quality and quantity of the RNA were determined spectrophotometrically at 260 and 280 nm (ND/1000 UV/Vis; Thermo Fisher NanoDrop, USA). Two-step real-time RT-PCR was conducted with both the reverse transcription (RT) reaction and the quantitative polymerase chain reaction (qPCR) run using the CFX Real Time System (BioRad, USA). The RT reaction was performed at a final volume of 20 μL with 180 ng of RNA (as a cDNA template) using the cDNA reverse transcription kit according to the manufacturer’s protocol. The products from the RT reaction were amplified using the FastStart Universal Probe Master (Rox) kit with TaqMan probes as primers for specific genes encoding Actb, Pparγ and Glb1. Amplification was carried out in a total volume of 20 μL containing 1× FastStart Universal Probe Master (Rox) and 1 μL of the RT product, which was used as the PCR template. Standard qPCR procedures were performed as follows, 2 min at 50 °C and 10 min at 95 °C, followed by 45 cycles of 15 s at 95 °C and 1 min at 60 °C. The threshold value (Ct) for each sample was set during the exponential phase, and the ΔΔ Ct method was used for data analysis. Actb was used as the reference gene. The levels of PPARγ and β-Gal proteins were determined after 24 or 48 h of 1 μM of VGVAPG treatment via enzyme-linked immunosorbent assays (ELISA). Specific detections of these proteins were obtained using ELISA and subsequently subjected to quantitative sandwich enzyme immunoassay. Assay was performed according to the manufacturer’s instructions (Elabscience Biotechnology, Wuhan, China). Briefly, a 96-well plate was pre-coated with monoclonal antibodies specific to Pparγ or β-Gal. Standards and collected cell extracts were added to the wells and incubated for 90 min at 37 °C. Next, after removing the liquid, 100 μL of biotinylated detection antibodies were added for 60 min. After washing three times to remove any unbound substances, horseradish peroxidase-conjugated avidin was added. Following additional washing, 90 μL of substrate solution was added to the wells for 15 min. Then, 50 μL of stop solution was added and the absorbance was measured at 450 nm, and this value was proportional to the amount of either Pparγ or β-Gal. The total protein concentration was determined in triplicate in each sample using a Thermo Fisher NanoDrop device. The data are presented as means + SD of three independent experiments. Each treatment was repeated six times (n = 6) and measured in triplicate. In the figures, there was presented one representative experiment. The data were analysed via one-way analysis of variance (ANOVA) followed by Tukey’s multiple comparison procedure ***p < 0.001, **P < 0.01 and *P < 0.05 vs. the control. After 3 h of the mouse astrocytes’ exposure to 50 nM, 1 and 50 μM of the VGVAPG peptide, only a 50-nM increase in Glb1 mRNA expression by 18.40% was noted. Expression of Pparγ did not change (Fig. 1a). After 6 h of mouse astrocytes’ exposure to 50 nM, 1 and 50 μM of the VGVAPG peptide, only a 50-nM increase in Glb1 mRNA expression by 22.71% was noted. After astrocyte stimulation by 50 nM and 1 μM of the VGVAPG peptide, Pparγ mRNA expression increased by 48.80 and 81.56%, respectively, as compared to the control. However, 50 μM of the VGVAPG peptide decreased Pparγ mRNA expression by 69.84% as compared to the control (Fig. 1b). β-Gal protein expression did not change after 24 h of the mouse astrocytes’ exposure to the VGVAPG peptide. 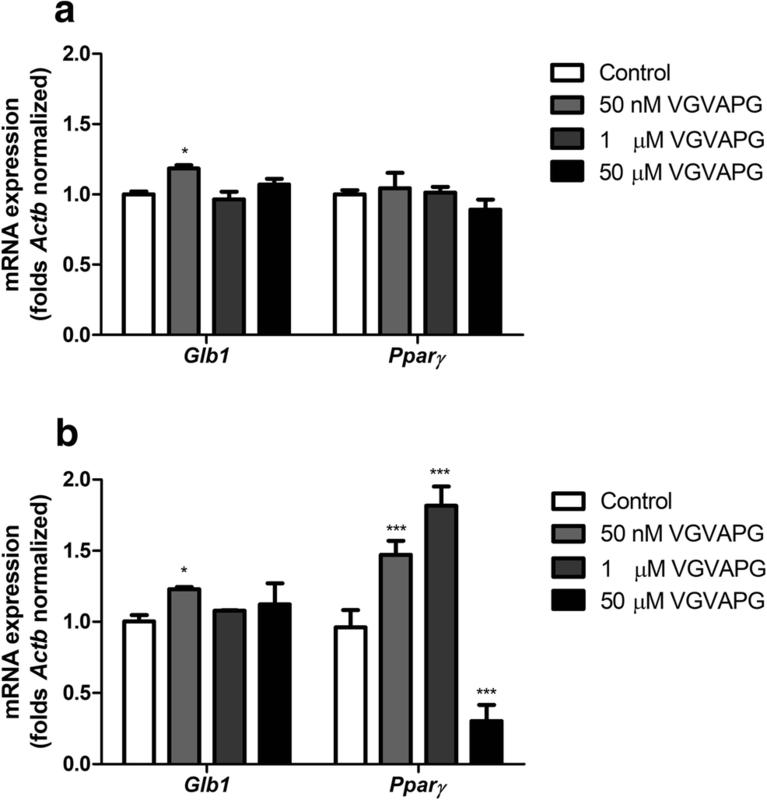 Pparγ protein expression decreased after stimulation with 1 and 50 μM of the VGVAPG peptide (a decrease by 0.25 and 0.32 ng/mL, respectively) (Fig. 2a). After 48 h of the mouse astrocytes’ exposure to 50 nM and 50 μM of the VGVAPG peptide, β-Gal protein expression decreased by 4.42 and 4.33 ng/mL, respectively. Pparγ protein expression increased after stimulation with 50 nM and 1 μM of the VGVAPG peptide (an increase by 0.21 and 0.42 ng/mL, respectively) (Fig. 2b). Six hours after employing 50 nM Glb1 siRNA, expression of Glb1 mRNA decreased by 51.75% as compared to the control. Pparγ mRNA expression slightly decreased but was not statistically significant. In the same time period, 50 nM of Pparγ siRNA did not affect the expression of Glb1 mRNA; however, Pparγ mRNA expression decreased by 66.89% as compared to the control (Fig. 3). Twenty-four hours after employing 50 nM of Glb1 siRNA, β-Gal protein expression decreased by 3.03 ng/mL as compared to the control. Expression of the Pparγ protein did not change. In the same time period, 50 nM of Pparγ siRNA decreased the protein expression of both β-Gal and Pparγ by 2.80 and 0.19 ng/mL, respectively, as compared to the control (Fig. 4). Forty-eight hours after employing 50 nM of Glb1 siRNA, β-Gal protein expression decreased by 10.81 ng/mL as compared to the control. Expression of the Pparγ protein also decreased by 0.80 ng/mL. In the same time period, 50 nM of Pparγ siRNA decreased the protein expression of both β-Gal and Pparγ by 11.15 and 1.05 ng/mL, respectively, as compared to the control (Fig. 5). Twenty-four hours after employing 10 μM of pioglitazone and 10 μM of rosiglitazone, an increase in β-Gal protein expression by 7.26 and 6.88 ng/mL, respectively, was noted as compared to the control. Cells co-treated with 1 μM of the VGVAPG peptide, pioglitazone or rosiglitazone decreased β-Gal protein expression by 3.42 and 4.97 ng/mL, respectively, as compared to cells treated with pioglitazone or rosiglitazone alone (Fig. 6a). In the same time period, 1 μM of the VGVAPG peptide decreased Pparγ protein expression by 0.20 ng/mL as compared to the control. Use of pioglitazone and rosiglitazone increased Pparγ protein expression by 0.56 and 0.75 ng/mL, respectively, as compared to the control. Co-treatment with VGVAPG and rosiglitazone decreased Pparγ protein expression by 0.70 ng/mL, respectively, as compared to cells treated with rosiglitazone alone (Fig. 6b). Forty-eight hours after employing pioglitazone, an increase in β-Gal protein expression by 11.65 ng/mL was noted as compared to the control. Cells co-treated with the VGVAPG peptide and pioglitazone decreased β-Gal protein expression by 7.45 ng/mL, respectively, as compared to cells treated with pioglitazone alone (Fig. 7a). In the same time period, the VGVAPG peptide increased Pparγ protein expression by 0.24 ng/mL as compared to the control. Use of pioglitazone and rosiglitazone increased Pparγ protein expression by 1.53 and 1.50 ng/mL, respectively, as compared to the control. 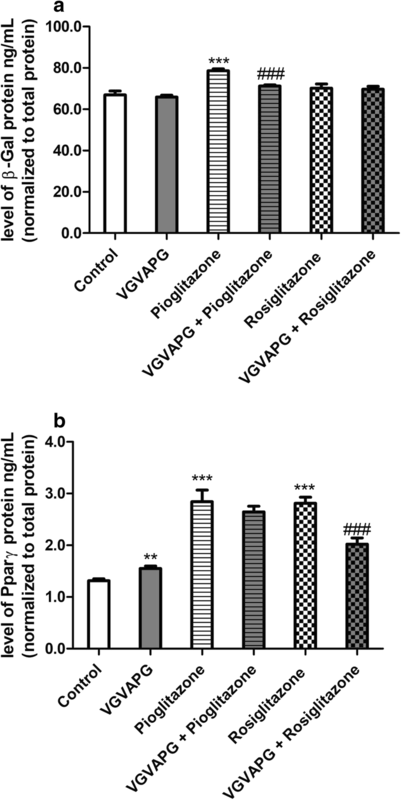 Co-treatment with VGVAPG and rosiglitazone decreased Pparγ protein expression by 0.79 ng/mL as compared to cells treated with rosiglitazone alone (Fig. 7b). To date, significant degradation of elastin in cerebral autosomal dominant arteriopathy with subcortical infarcts and leukoencephalopathy syndrome in patients with atherosclerosis, diabetes and connective tissue diseases have been reported (Baydanoff et al. 1987; Katsuda et al. 1990; Caronti et al. 1998; Colburn et al. 2003). Clinical and in vivo studies have shown that esterase activity and the EDP level are increased in both obesity and diabetes (Bizbiz and Robert 1996; Talukdar et al. 2012). Contrarily, EDP injections in mice fed a chow diet induced hyperglycemia with simultaneous lipid accumulation, which was also observed in more than 80% of patients with T2DM (Smyth and Heron 2006; Neeland et al. 2012; Blaise et al. 2013). Moreover, it has been described that anti-elastin antibodies of IgG are elevated nearly three times in T2DM patients as compared to the control (Bako et al. 1987; Bizbiz and Robert 1996; Bizbiz et al. 1997). The number of EDPs in human brains also increases along with the age of the patients (Nicoloff et al. 2008; Tzvetanov et al. 2008). Based on the above data, Blaise et al. (2013) demonstrated that EDPs can regulate the development of insulin resistance in mice in a PPARγ-dependent manner (Blaise et al. 2013). Therefore, first, we studied the impact of the VGVAPG peptide on β-Gal and Pparγ expression in mouse astrocytes in vitro. Our experiments are the first to show that the VGVAPG peptide affects mRNA and protein expression of β-Gal and Pparγ in mouse astrocytes in vitro. The profile of mRNA and protein expression of β-Gal after 3, 6 (for mRNA) and 24 h (for the protein) was similar. However, after 48 h of exposition to the VGVAPG peptide, the protein expression of β-Gal decreased in concentrations of 50 nM and 50 μM. Interestingly, cell stimulation with 1 μM of the VGVAPG peptide did not change the expression profile of β-Gal mRNA and the protein in all of the studied time intervals. Pparγ mRNA and protein expression were more consistent. In our experiments, expression of Pparγ mRNA did not change significantly after 3 h of exposure to the VGVAPG peptide, but after 24 h the Pparγ protein level slightly decreased. However, after 6 h of exposure to the VGVAPG peptide, we observed an increase in Pparγ mRNA expression which probably preceded the increase in Pparγ protein expression after 48 h. This effect is a natural time shift between mRNA and protein expression. Moreover, we believe that an initial decrease followed by an increase in the level of protein is a well-described phenomenon in which different PPARγ agonists in a wide range of concentrations can cause its degradation after receptor activation (Hauser et al. 2000). On the other hand, the second phenomenon has been described as hormesis, in which opposite effects caused by different concentrations are often observed, usually in natural ligands, and it can take the shape of a non-linear dose-response (Fujimoto et al. 2000; Johnson et al. 2010). In this situation, a different signalling pathway could be activated or inhibited depending on the concentration used (Calabrese and Baldwin 2002). It has been shown that the VGVAPG peptide exhibits such non-linear activities in human fibroblasts and monocyte cells (Senior et al. 1984). Senior et al. (1984) stated that in the range of 1 to 10 nM and 1 μM, the VGVAPG peptide has chemotactic properties, whereas below 1 nM and in the range between 10 nM to 1 μM the VGVAPG peptide does not show such properties in monocytes. We observed a similar situation in our research, where in concentrations of 50 nM, 1 and 50 μM the VGVAPG peptide acted in various ways. To date, only a few papers have described that EDPs or the VGVAPG peptide increase the expression of GLB1 mRNA in normal human bronchial epithelial (16HBE) cells or colon adenocarcinoma (Caco-2) cells (Toupance et al. 2012; Fumery et al. 2017). Contrarily, only the available data show that there was an increase in Pparγ mRNA expression in the fat tissue of mice injected with EDPs (Blaise et al. 2013). Our data show that after 6 h of using Glb1 siRNA, expression of Glb1 mRNA significantly decreased along with a slight decrease in Pparγ mRNA expression. In the same time period, Pparγ knockout caused a decrease in Pparγ mRNA expression but did not affect expression of Glb1 mRNA. The effect of gene knockout by siRNA was translated to the protein; therefore, after 48 h of using Glb1 siRNA, we observed a decrease in the expression of both the β-Gal and Pparγ protein. Similar use of Pparγ siRNA caused a decrease in the expression of both the β-Gal and Pparγ protein after 48 h. It was found that PPARγ agonists are able to induce GLB1 mRNA expression and activity in Caco-2 cells (Fumery et al. 2017). Furthermore, the functional response element activated by PPARγ was identified in the promoter of the human GLB1 gene. PPARγ was also shown to regulate β-Gal expression and activity in the gut (Fumery et al. 2017). Our data show a similar relation; moreover, we suggest a bidirectional interaction between Pparγ and β-Gal. In our experiments, silencing of one protein causes a decreased level of both of the proteins. Our experiments show that the use of either pioglitazone or rosiglitazone (well-known PPARγ agonists) increases both β-Gal and Pparγ protein expression. Astrocytes co-treated with the VGVAPG peptide and pioglitazone or rosiglitazone reduced the effects of TZDs alone. These data confirm the interaction between β-Gal and Pparγ. To date, it was found that an increased level of EDPs increased the level of blood glucose and body weight (Blaise et al. 2013). Obese mice with neuronal Pparγ knockout were leptin-sensitive but showed impaired glucose tolerance (Fernandez et al. 2017). Moreover, Lu et al. (2011) showed that neuronal Pparγ was required, at least in part, for TZD-induced hyperphagia, weight gain and the insulin-sensitising effect of thiazolidinediones in mice (Lu et al. 2011). Our results are consistent with the actual state of knowledge and suggest that EDPs and TZDs could be key factors involved in the development and prevention of T2DM chronic complications in the nervous system. Moreover, our research has shown that an increased level of EDPs (particularly the VGVAPG sequence) can probably impede the therapeutic effect of pioglitazone and rosiglitazone in the organism. Our study has shown, for the first time, that the VGVAPG peptide affects β-Gal and Pparγ mRNA and protein expression in mouse astrocytes in vitro. Furthermore, we suggest that there could be a bidirectional interaction between Pparγ and β-Gal. 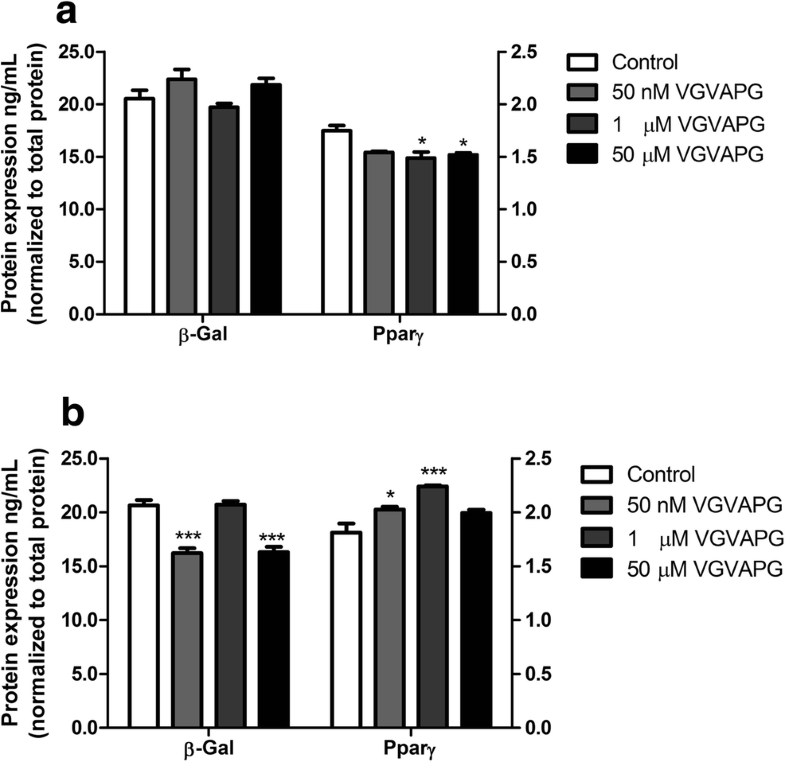 Both pioglitazone and rosiglitazone increase β-Gal and Pparγ protein expression in mouse astrocytes in vitro, and this effect is reduced by the VGVAPG peptide. However, due to the lack of sufficient data explaining the molecular mechanism of VGVAPG peptide action in the nervous system, more studies in this topic are needed. This work was supported by statutory funds from the University of Information Technology and Management in Rzeszow, Poland (DS MN 503-05-02-03). KS and JG conceived and designed the research. KS conducted experiments. KS analyzed data. KS and JG wrote the manuscript. All authors read and approved the manuscript. All procedures were performed in accordance with the National Institutes of Health Guidelines for the Care and Use of Laboratory Animals and were approved by a Bioethics Commission (No. 46/2014) as compliant with Polish law.